The men are packing up the ships to start their journey south to get rescued. One of the men talks with Cornelius and some others about staying behind the larger group. Francis is giving another group of men directions to follow to find land and rescue. Blanky and Francis are headed out and Francis waxes poetic about leaving the ship. One of the men talks to Dr. Goodsir. He's afraid. He can't stop smelling the smell of burning men. He hugs Dr. Goodsir. Goodsir goes to Francis and tells him the men can't continue to eat the food because it's poisoned but Francis won't relent. The men have to eat the food until they get to where they are going. Lady Silence is traveling with the men? Some men find the advance team dead. Francis orders them not to say anything to the others. The group finds land. Goodsir is going to autopsy the monkey. One of the men has collapsed. he starts losing his mind. Another man is starting to lose it inside one of the tents. Lady Silence comes ut to see what's going on. The man still has his weapon raised. It accidentally goes off and he is shot. Goodsir is very upset because he knows that it could have been prevented hd he not eaten the poisoned food. Lady Silence comes into Goodsir's tent and lays with him to try to comfort him. The next morning she's not with him. Francis is asking Harper about the night they captured Lady Silence. Francis wants to know who the four men were and Harper tells him. Jopson comes in to talk with Francis. Some men are burying the guy who killed himself. 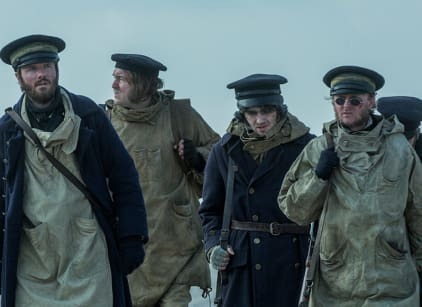 Francis has a command meeting and he tells the men what Dr. Goodsir has found. He has a plan to start hunting for food. Jopson is promoted to Lieutenant. Hickey is talking to a couple of guys to determine what happened with the guy who killed himself. Hickey doesn't think it's scurvy. He believes Goodsir and the captain is lying to them. He figures out that it's something in the food. Hickey has a hunk of "meat" which is a man. He's suggesting cannibalism in order to survive. Hickey is traveling with one of the other men. They are going to walk for 1/2 hour. They find Inuit people walking. One of the men is going to talk with them. Irving is the one who approaches them. Hickey and hte other guy are gone so Irving goes looking for them and tells the Inuit to stay until he gets back. Hickey has lost his mind. He's committing murder to get food for people. He kills Irving.